Hawthorn House is a Victorian house over-looking the stunning Windrush Valley on the outskirts of Witney. We are very conveniently located for both business visitors to Witney, Oxford and Brize Norton and for holiday makers wishing to explore the Cotswolds and rural Oxfordshire. A freshly prepared full English breakfast is served in the dining room, and a nearby pub offers good home-cooked evening meals. We are within easy walking distance of Witney town centre. 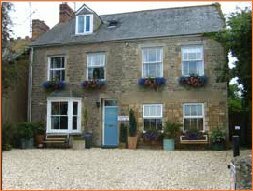 We have five guest bedrooms, all with en suite facilities, TV, Wi-Fi internet connection, and tea/coffee trays. All our rooms are furnished to a high standard with our guests comfort and convenience in mind. King-size double bedroom with en suite bath/shower room. Twin bedroom with en suite bath/shower room. Twin bedroom with en suite shower room. Twin bedroom (on second floor) with en suite shower room. Our cooked breakfasts are prepared with local produce where possible and include cereals, fruit juices and a selection of teas and coffee. Special dietary requirements can be catered for. The dining room opens onto the garden where our guests may sit and relax on fine evenings.